① Heat up a small nonstick skillet over medium heat and add a 1/2 tbsp of butter. Slice the jalapeno chile thinly and remove the seeds if desired. ② Saute the jalapenos for about 10 minutes until tender and slightly browned. Remove the jalapenos and cook the bacon until crispy, then drain on a paper towel and crumble the bacon with your hands. ③ Heat up a cast iron skillet over medium heat and add enough butter to coat the bottom of the pan. Lay your bread slices down and top them with an even layer of sliced cheese squares Cook until they get golden brown, which should only take a few minutes. 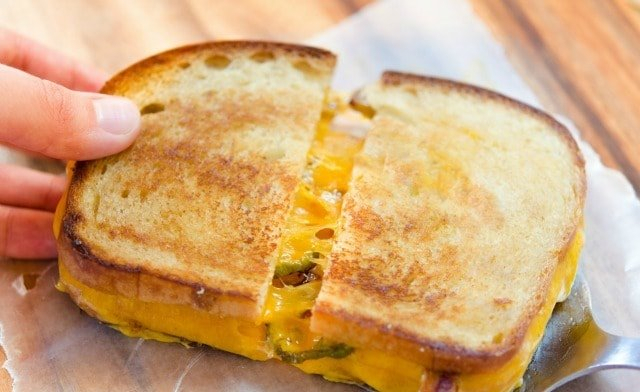 ④ Sprinkle the cooked jalapeno and bacon crumbles evenly over the melted cheese, then press the two pieces of toast together to make a cohesive sandwich. White New York State Sharp Cheddar Cheese , aged a minimum of 1 year. Has a smooth, creamy texture and distinctive "bite" that only long, careful aging brings.